Sony is still figuring out how to innovate. In addition to three new smartphones, the company announced four concept gadgets, one of which will actually come to market this summer. The gadgets were prominently displayed at Sony’s MWC booth as a preview of what’s to come, but what’s coming is not exactly clear. The first of the four products is the only one coming to market: the Xperia Ear. It’s a small Bluetooth and NFC-connected virtual assistant that rests in your ear. It looks similar to the Moto Hint, though it offers so much more functionality. You can takes calls with it, send messages, and even ask it for directions if you’re driving. You can customize all of that functionality through its companion smartphone app. The Xperia Ear is quite comfortable to wear, though the demo screamed in my ear a few times. The Xperia Ear was in demo mode when I tried it on, so I couldn’t test any of the functionality. Sony said it’s still working out some of the kinks on the device before it launches it this summer. Google Glass was a hard sell because of the camera strapped to your face, so I’m not sure how Sony is going to make the Xperia Eye seem compelling. This isn’t the kind of accessory I could see pairing with my outfits. The Xperia Eye is a casual life-logging camera, though this one offers an ultra-wide-angle, 360-degree lens, as well as facial and voice detections so you’re not just rolling the entire time. The Eye doesn’t actually work, but I did try on the prototype. I’m not sure I’m keen on the idea of wearing a camera clipped to my clothing, though. The Xperia Projector is perhaps the only useful of the four concept devices. This was my favorite of Sony’s four concept gadgets, if only because I could actually see my family and I using it. The Xperia Projector is pretty self explanatory: It projects an touch-enabled interface onto a flat surface. You can then interact with it through touch or voice. It’s still in its nascent stages, but Sony said that this particular product will be geared toward busy families attempting to find some peace in their otherwise chaotic lives. 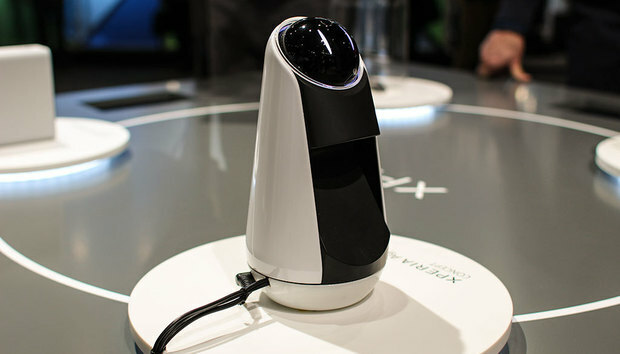 The Xperia Agent looks like a Soda Stream with eyes. The Xperia Agent is a personal assistant with virtual Wall-E eyes that listens for voice commands. Its features sound similar to Amazon’s Echo, but no one in the Sony booth would allow me to refer to it as such. Once you give the Agent a command, it will project information onto the table. It doesn’t work, but it certainly looking interesting. I wouldn’t call it a shining example of Sony’s design prowess, though. I’ll be honest: it’s nice to see Sony attempt some innovation in a sea of sameness. But I’d rather the company focus on improving the gadgets it has out on the market rather than come out of left field with devices that people aren’t exactly clamoring for. It’s obvious that Sony is just desperate to figure out what to do next to get spotlight back.